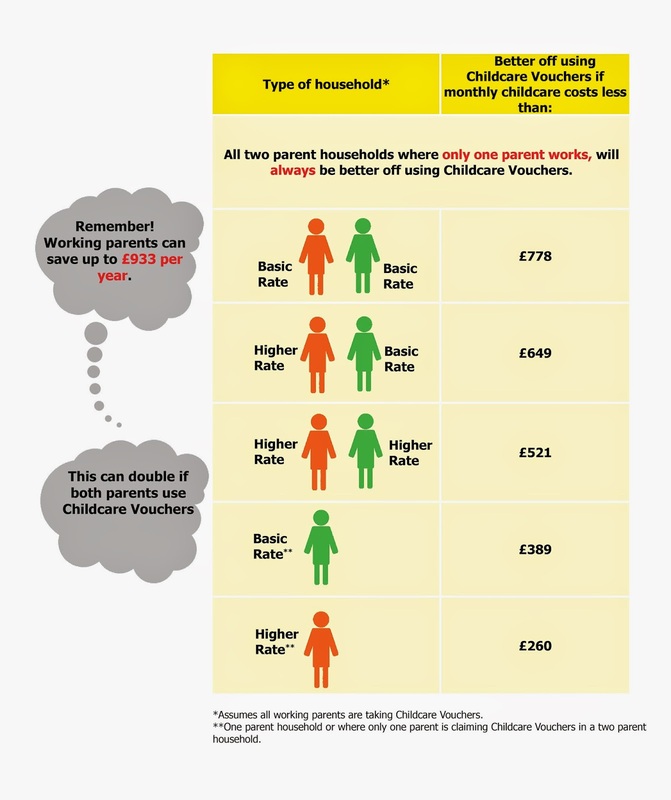 Childcare Vouchers are used by more than 500,000 working parents in the UK to help make childcare more affordable. Next autumn, the Government is launching their new Tax-freeChildcare scheme which will see them paying for 20% of a child's childcare fees on costs of up to £10,000, potentially saving up to £2,000 per child, each year. The scheme will only be available for children up to the age of 12 and only households where both parents work, will be eligible to receive the subsidy. As great as this sounds, there will be many parents and families who will be better off using Childcare Vouchers. Childcare Vouchers will remain in existence for as long as they are required, however the scheme will only be open to those already using it before Tax-free Childcare is implemented. To benefit from the new scheme, parents will have to wait until the autumn of 2015. Whichever scheme provides maximum savings for you and your family, using Childcare Vouchers now could save you more than £933 before Tax-free Childcare is even available. If you are already using Childcare Vouchers, as long as you continue to do so before the new scheme is implemented, you will be able to choose whichever scheme provides your family with maximum savings. If you have friends or family who would benefit from using Childcare Vouchers, ask them to get in touch with us and we will contact their employer to discuss setting up a scheme. Email information@busybeesbenefits.com. Not already using Childcare Vouchers? Childcare Vouchers are available from your employer. Ask your HR department if they offer a scheme and register to start making savings from your next pay date. If your employer doesn’t already offer a scheme, contact Busy Bees Benefits by emailing information@busybeesbenefits.com with your employer's details and we will get in touch to discuss setting up a scheme – your employer will make savings too.